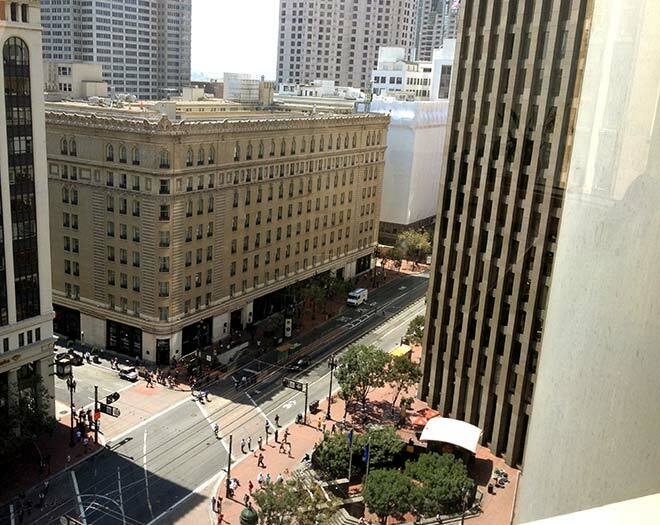 About Us | San Francisco Commercial Real Estate Services Firm | Blatteis Realty Co.
View from office at 44 Montgomery and Market Street, San Francisco. Our Philosophy: To cultivate innovative, successful business partnerships established from a rock-solid heritage of premier property space for lease and sale. Independently owned and operated since 1922, Blatteis Realty was one of the first San Francisco real estate companies to specialize in retail and office space for lease. By emphasizing cooperation amongst our own team members as well as the brokerage community, our company's presence and knowledge of San Francisco and the Greater Bay Area has, for almost a century, secured the multigenerational loyalty of Property Owners, Institutional Organizations, Tenants, Principal Developers, and Brokers. Blatteis Realty's reputation for collaboration, knowledge, and extensive service grew alongside San Francisco's rise as a world center and international destination for fashion, retail, and entertainment. Our firm is a full-service brokerage company that covers the complete range of commercial real estate transactions: Retail Real Estate Services, Investment Sales & Acquisitions, Tenant Representation, Landlord Representation, Location Strategy Services, Commercial Real Estate Consulting Services, Property Management, and more. Our team of experts knows the value of maintaining relationships. Our clients know us for our knowledge and integrity. For a complete list of the services offered, please browse our website or contact us directly.